This Honey Prosciutto Appetizer made with flatbread crackers, gouda, prosciutto, and slivers or red onion is so quick to prepare and the flavor is ridiculously delicious. This is hardly a recipe. It’s more like a delicious combination of flavors that has totally made it to our list of keepers. Although when prosciutto is involved, how can you go wrong? If you’re not familiar with prosciutto, it is dry-cured ham that is usually very thinly sliced. Prosciutto is perfecto! And when paired with honey and cheese it is amazing. 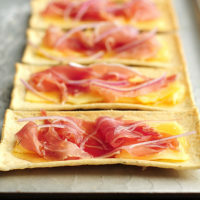 Begin with flatbread crackers or another type of cracker, crunchy bread or toast, followed with a thin (or not so thin!) layer of gouda cheese (gruyere would do nicely as well), a small pile of prosciutto, and a smidgen of thinly sliced red onion. Then drizzle it all with honey, and you’ve got yourself a flavorful appetizer for your next party, or, if you prefer, an afternoon snack to beat all others. This Honey Prosciutto Appetizer is as simple as that. Oh so simple, but oh so very satisfying! Prepare a tray of these delectable flatbread appetizers for you next gathering and just watch them disappear. 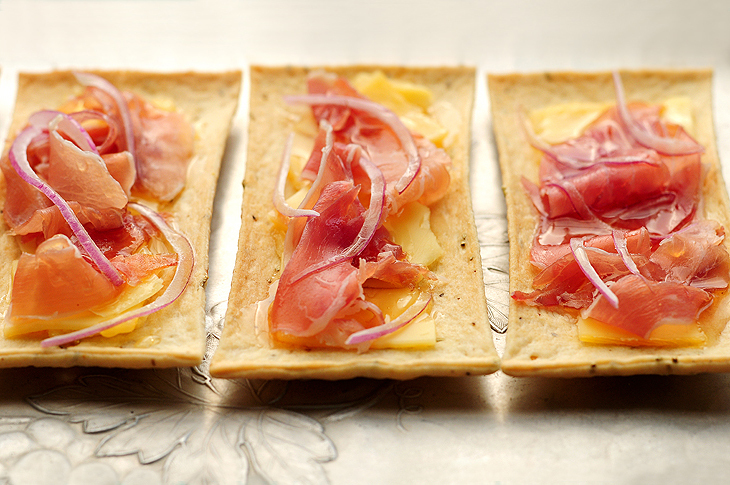 Begin with flatbread crackers, followed with a thin layer of gouda, a small pile of prosciutto, and a smidgen of thinly sliced red onion, all drizzled with honey, and you've got yourself a flavor party for your next party. 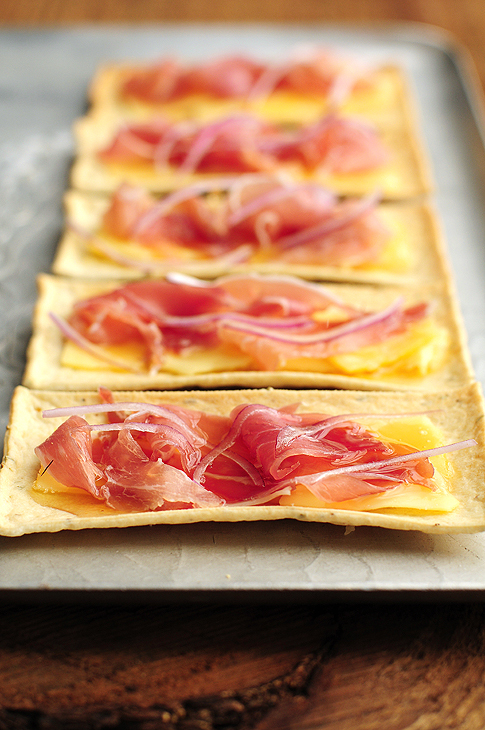 Layer the gouda, prosciutto, red onion on the flatbread crackers, drizzle with honey, and watch them disappear. These look lovely and delicious! Prosciutto is one of my absolute favorite ingredients to work with. The combo does look great and I can see these appetizers getting instantly snapped up. I’ve never seen flatbread crackers before, so I need to scope this out! The creamy, salty, sweet flavors as well as the crunchy and soft texture make this a perfect pre-meal snack! the simplest things are always the prettiest and tastiest! This looks so fresh and yummy, I love the simplicity and flavors! Whether you consider this a recipe or not, I consider it brilliant! Thinking we need this on Easter! 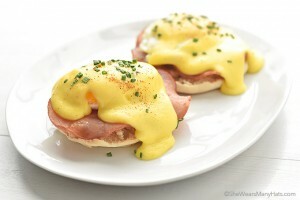 OH, I could eat this for BF this morning. So yummy! Happy Easter Amy! I could hork down about a dozen of those little pretties at this very moment. Absolutely gorgeous, Amy! I can’t wait to try this recipe. It looks like it will immediately become one of our favorites! How do we feel about a tiny rosemary addition? For some reason, when I imagined taking a bite, there was a bit of rosemary hiding out in there too. They look beautifully simple, Amy. This is so simple yet so elegant. What a great idea and I too love this combo of flavors! Such a simple preparation and they look so delicate and pretty! Perfect for my little party tonight!!! Why I think I would love this Amy…typical of my favorite appetizers. Light, fresh, great, simple flavors. Gorgeous too! Amy these look amazing…………I want to reach in and grab one right now! Oooh, I love these. They’re so pretty. Just made these as a test run for a bridal shower in a month. They taste and look fantastic and are so simple to make!! Yay Sian! So glad to hear. What a perfect dessert for a bridal shower. I can be there in about 14 hours. I’ll bring wine. You make these. Deal? Simple combo recipes are great. Especially when they combine sweet, savory and some crunch! The yum factor is off the chain. I love your blog! Happy Saturday. This is simplicity at its best! I’ll bet the drizzle of honey rounds out the flavors perfectly. These appetizers do look terrific. I made them for a party where there were several other appetizers available. Only four of them were eaten. The have very little flavor which did surprise me. They definitely were not the hit of the party. I’m sorry you didn’t enjoy them Nita. They didn’t last long here!